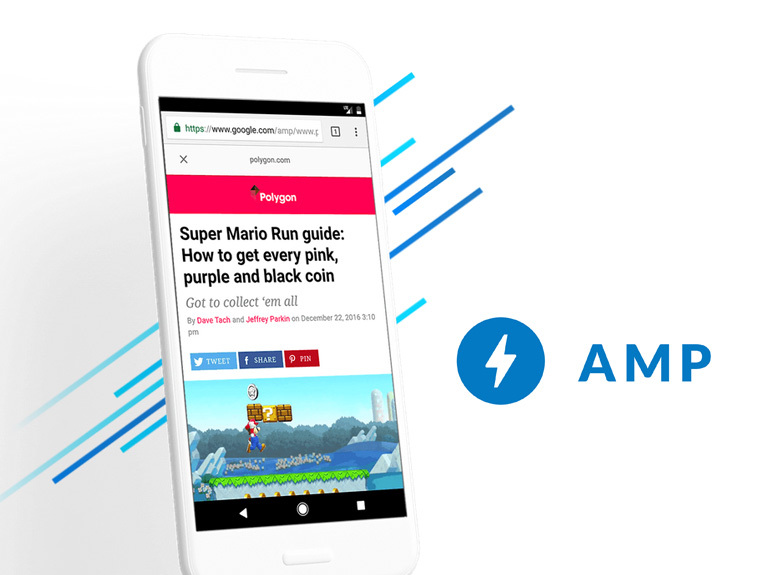 Google AMP (Accelerated Mobile Pages) project is a framework based on open-source technology and enables faster loading of web pages on mobile devices. Although many site owners are not aware of the term, Google takes its AMP project very seriously and also includes it in the search engine ranking criteria. The project quickly grabbed the attention of thousands of active developers soon after its launch in February 2016. We now have a huge number of sites that also have AMP versions of the web pages. This makes it very important for all site owners to consider the technology for better search engine ranking and an enhanced user experience. Since a vast majority of online users now use their mobile devices to access the internet, AMP has become more important than ever, especially for bigger companies and sites. The open-source and mobile-friendly technology enables developers and publishers to improve page loading speed on mobile browsers, ultimately resulting in a better user experience. The improvement in speed and efficiency does not come at the cost of decreased revenues as AMP has no effect on revenue generated by advertisements. Although this guide mostly covers AMP on WordPress, most things work similarly on other platforms and the objective remains the same i.e. to improve page loading time and enhance the user experience. 10 Should You Use AMP? An experienced developer can also optimize web pages for mobile browsers and achieve results similar to Google AMP. But it’s not an easy thing to do and can take a lot of effort and work hours. That’s where Google AMP comes handy as it makes it easier to execute page loading optimizations in less time. AMP can be very useful in enhancing SEO and rankings. That’s the reason so many enterprises have adopted the technology, while small and medium businesses are also quickly catching up. Google AMP Cache is a Content Delivery Network of AMP pages and allows visitors to access a page from the nearest server. The AMP Cache distributes resource loading efficiently and aims to minimize the loading time and improve latency. AMP Cache is quite similar to Facebook Instant Articles, but its scope is much larger and can be used by other platforms such as Google, LinkedIn, Twitter and Reddit. When a user clicks an AMP-enabled page on their mobile browser, Google serves that page from the AMP Cache, resulting in much quicker page loading. Although AMP is a blessing for users with slow internet connections, marketers, bloggers and SEO experts face several challenges when deciding to opt for the technology. Limited customization options and support for analytics and advertisement platforms are at the top of the list. Some experts even believe that you’ll lose mobile traffic (instead of increase) after implementing AMP. Some also believe that Google handles the page redirects in a somewhat dishonest way, but as with most other technologies, everything has its pros and cons. It’s highly recommended to consider all the pros and cons before switching to AMP. Many believe that it’s not easy to switch back to ‘normal’ once you enable AMP on your website. Since AMP pages are served from Google AMP cache, users may still see AMPs links even after you have removed the plugin and disabled AMP on your WordPress site. This can lead to error pages, and getting around these errors can be tricky. You can use ‘update-ping’ mechanism to remove content from AMP cache or use page redirects, but this could become a huge issue when dealing with thousands of pages. Just make sure to do ‘proper’ homework if you decide to go the AMP route. Being one of the most flexible, extensible and widely used Content Management Systems, WordPress allows users to easily implement AMP on their websites. Instead of solely relying on experienced developers to optimize content delivery, WordPress allows ‘common’ users to get most of the things done with less effort. The official AMP plugin is one of the easiest, fastest and simplest ways to implement AMP. Installing and activating the plugin is quite straightforward. Once you have activated the plugin, go to plugin’s appearance settings, click AMP and check how AMP-enabled pages look on different mobile devices. The appearance section allows configuring the text color and header background, which is also used for links. The AMP plugin uses site’s logo or icon by default (provided the theme also supports it). Once you are done with the appearance section and saved changes, it’s time to view posts after adding /amp/ at the end of each URL. For example, in case of https://yourblog.com/aboutme/, enter https://yourblog.com/aboutme/amp/. This shows you the AMP version of a post on mobile devices. Many users have reported getting a 404 error when they try to view AMP version posts, but it can be fixed easily. Just go to WordPress admin area, Settings, Permalinks and click the Save Changes button without actually changing anything. Doing so would refresh the permalink structure and fix the 404 error in most cases. “account”: “UA-XXXXX-Y” This is where you need to enter the Google Analytics Property ID. Revalidate the AMPs after making changes so they become trackable. The ease-of-use and simplicity of the AMP plugin come at the cost of lack of customization options. There isn’t much you can change using the core plugin, but you can use other plugins to configure more settings. Glue add-on for Yoast SEO and AMP is one of them and you’d have to go to SEP -> AMP after installing and activating the plugin. There you can enable AMP for other post types as well or choose design and color options on the design tab. After setting up and activating AMP in WordPress, you may also want to know how the AMP pages are performing. Google Search Console makes it very easy to analyze AMP performance. Just login into the console, click Search Appearance then AMPs. You may not see the results immediately as Google can take some time to index AMP pages and show them in the console. It depends on many things. If you have already optimized your site for faster page loading and performance, then you probably don’t need AMP. However, it does help in SEO and enhances search ranking provided other requirements are also fulfilled. If your website is not properly optimized for mobile devices and does not load fast, going the AMP route may give it a significant performance boost. AMP is not something entirely new as there were ways of optimizing pages long before its launch. But it makes things a lot easier by offering an all-in-one solution for users who don’t have time or resources to optimize their websites manually. The biggest concerns experts have about Google AMP is the lack of control they get over the pages and the difficulty involved in switching back to ‘normal’. AMPs are also not magic bullets that can boost ranking overnight as you also need to meet other criteria. Deciding to implement AMP can be a tough decision to make, but with the right information and analyzing your own situation/requirements, the options become clearer. It’s more about offering visitors a better experience and if AMPs can help, why not give the technology a try? I was looking for the same type of post for my work. Your post just made my work more easy by proper guidance and proper illustration.Any installation techniques need some serious knowledge to get the best outcome. I really love the way you describe your thoughts and represents your content. Google Accelerated Mobile Pages (AMP) can significantly boost your website speed and make it better optimized for mobile users. Whether you know it or not, the AMP project is an open-source initiative created by Google to give super fast and high quality experience to the users who are mostly using their smartphones for online browsing. Definitely it’s worth giving a try. That being said, setting up Google AMP for WordPress sites is so easy when compared to any other blogging platforms as there are a couple of plugins which can help you easily set up even if you’re a beginner. I didn’t know there are so many customizations you can do with AMP plugin until I read this post, so thanks for sharing all that useful information. Now coming to the question: Should you use it? Well, definitely yes as I don’t see any negative results by implementing it. Thanks for sharing the post with us Oliver. Very informative post and WordPress is among the early supporters of Google AMP Project. Google AMP plugin for WordPress is quite useful for making the mobile web faster i.e. 4 times faster, which will be a crucial factor for enhancing user experience. Also, Baidu – the Chinese search engine is now supporting Google AMP project and will consider AMP sites in SERP result as Google has made it a norm for getting higher ranking on search result. Very soon others will be following the same trend and we will be witnessing Google’s footsteps.